Who doesn’t love hide and seek? “What can we do today Mum?” my eldest asked me. “I’m not sure, it’s raining, again!” At that moment I had a Facebook notification and had a quick look at what it was. My sister-in-law had added me to a group called “Love on the Rocks UK”, I had a quick look through the page and gathered that the group had been derived from an American version of the same name. The premise is that families spend time together collecting (or buying!) rocks, decorating them by whatever means you fancy (paint, pen, glitter, feathers, you name it it can probably be done!) And then you hide them around parks, stately homes, villages, forests or wherever it might be found. You write the name of the group on the back and the hope is that the person then takes a photo of the rock, joins the group, posts a picture in the group and then either rehides the rock or takes it home. It is then hoped that that person heads home, makes some rock master pieces, which they then hide and the cycle then goes on! Just like a big game of hide and seek with a big group of strangers! “Love on the Rocks UK” has over 20,000 members so I was hoping to find some local hide and seekers, which sadly I couldn’t. After a quick Facebook search I found Wales Rocks, Caerphilly Smilestones and Rhiwbina Rocks but nothing specifically for the the wider Cardiff area so I thought I would set up a more local group in the hope that when the sun does come out (or the umbrellas) we are able to go for a walk and find some lovely decorated rocks, whilst also hiding the ones we prepared? I mean who doesn’t like finding a little bit of Sunshine/Rainbows/Love Emoji when out on a walk?!? 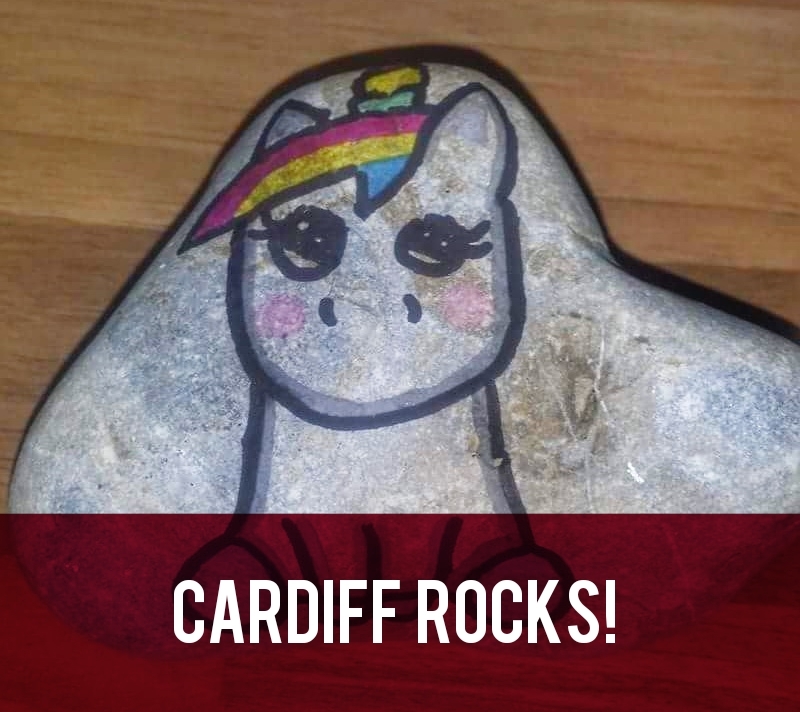 Visit Cardiff Rocks on Facebook. Found a rock but not been seduced by the evil information gathering demon that is Facebook. Where do you post a picture of a rock?